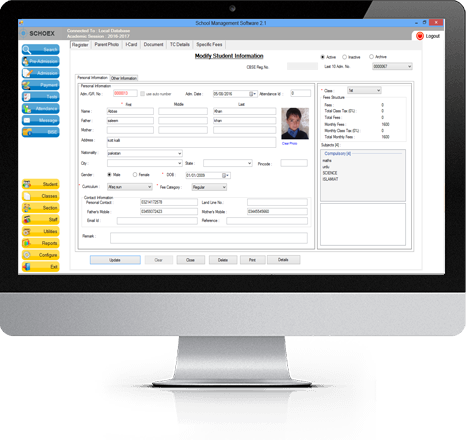 complete school management software to automat school processes. Many education professionals still use multiple software programs to collect and store data. They don't realize that they have a better option. School management systems like Schoex enable educational institutions to increase the productivity and efficiency of administrators and teachers alike, using a state-of-the-art software solution that provides easy, seamless integration of a wide range of software solutions. School management systems use feature-rich modules to streamline data input and collection processes at schools and colleges, while also providing valuable insight through detailed reports that can be customized by you to be used for specific individuals or classrooms. You'll be able to pull requested reports within seconds, that'll include all the required information organized in a clear, easily understood manner. Schoex is designed to communicate easily with other software, eliminating the need to make duplicate entries of student information. Common items like name, address, and birth date will only need to be entered once in order to be available from any platform, thereby reducing wasted time that is better spent focusing on other things. This means that teachers are able to focus their attention on developing better lesson plans rather than on completing administrative tasks. Schoex is deliberately designed to streamline educational institution processes and increase productivity with a user-friendly, simplistic approach that provides easy, yet reliable data management. We provide industry leading technology that helps remove the burden of administerial tasks, replacing them with simple applications that allow teachers, parents, and students access to a variety of information at their fingertips. These are some of the many reasons that Schoex is the leading student database management system.